I was fortunate enough to win one of these personalized key fobs from Just Add Dots a few months ago in a giveaway. I love mine so much that I just had to include this item in my list of ABOG Top Picks. These adorable key fobs are extremely affordable. They range from $15 for a key fob with one child to $36 for one with 6 children on it. I cannot imagine any mother, grandmother, god-mother, or aunt who would not love to receive one of these as gift. 1) There selection of hand painted key fobs also includes initials, graphics, and patterns. 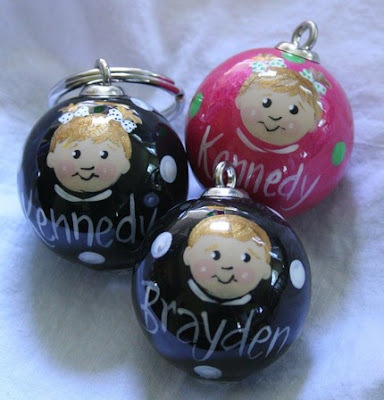 2) This boutique also offers hand painted ornaments with names and faces. 3) The shipping charge for these items is extremely reasonable. It is only $2.00 for the first item shipped within the U.S. and $4.00 for anywhere else in the world. It only costs an extra $1 to ship each additional item. As always, any store owner who has an item featured as an ABOG Top Pick is welcome to display the badge on their website or blog.